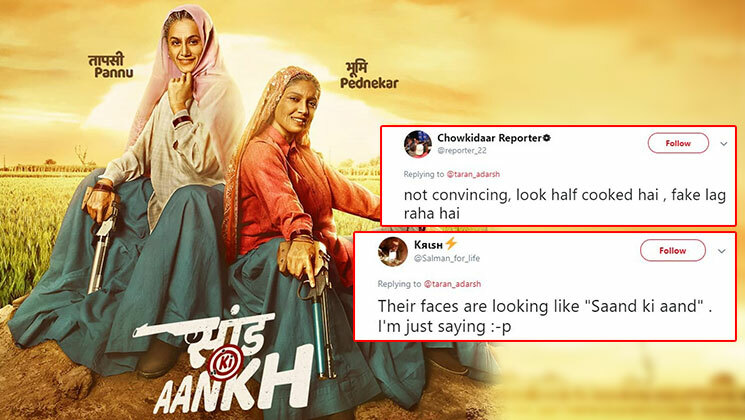 After giving us several sneak-peeks, the makers have finally revealed the posters of ‘Saand Ki Aankh’ featuring Bhumi Pedenekar and Taapsee Pannu. Both the actresses are playing sister-in-laws Chandra Tomar and Prakashi Tomar, the world’s oldest sharpshooters. This is their first movie where they are playing aged women on-screen. While some are appreciating their looks, there is a section of netizens who have mercilessly trolled their looks. A few Twitter users called their make-up ‘bad’, ‘terrible’ and fake’. A few declared that the movie will ‘flop’. Have a look at some of the trolls by Twitterati. why didn’t they just take older actors? A Mumbai Mirror report states that it was quite challenging for Taapsee to wear a rubber coating on the face for 12 hours a day. However, she loves challenges and knows how to get into the skin of a character. Produced by Anurag Kashyap, Reliance Entertainment and Nidhi Parmar, ‘Saand Ki Aankh’ is directed by Tushar Hiranandani. The movie is releasing this Diwali. What are your comments in the posters? Do let us know.